Last Tuesday, the UCLA Extension Department of the Arts gathered in DeNeve Plaza to honor 9 instructors in the areas of interior design, landscape architecture, studio arts, design communication arts, directing, music, creative writing and screenwriting. As instructors came up one-by-one to accept their award, each expressed their gratitude toward not only their administrators, but overwhelmingly, they were appreciative of their students. It was a nice reminder that teaching is a reciprocal act: both parties walk away with something in hand, whether it’s literally in the form of a finished manuscript or screenplay or insight into their own day-to-day application of their craft. April Halprin Wayland is author of seven picture books, including It’s Not My Turn to Look for Grandma! (Knopf) and New Year at the Pier: A Rosh Hashanah Story (Dial), named Best Jewish Picture Book and winner of the Sydney Taylor Gold Book Award. Ms. Wayland also won the Myra Cohn Livingston Award for Girl Coming In for a Landing: A Novel in Poems (Knopf) and has won seven poetry awards from the SCBWI. Michael Weiss is a screenwriter, WGA member, and former vice president of production for Miramax Films whose produced credits include Journey to the Center of the Earth; Hostel: Part III; and I’ll Always Know What You Did Last Summer. Mr. Weiss has sold original material and been hired on assignment by such studios as Warner Bros., Sony, New Line, MGM, and Universal, and is a contributing author to Cut to the Chase (Gotham Books/Penguin). 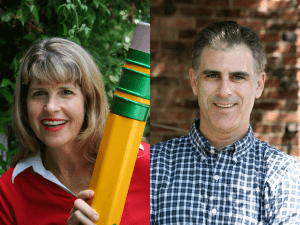 Please join the Writers’ Program in congratulating April and Michael! We thank you for sharing your talents as writers and teachers with us all! Jeff Bonnett is the Program Assistant for Screenwriting (Onsite & Online). Contact him at jbonnett@uclaextension.edu or (310) 206-1542.